We hope your holidays were fabulous or at least peaceful and that you’re ready to take on the new year! We’ve decided to find a new home and have been packing through the holidays. So that’s how we’ve been kicking off our new year and after next week, we’ll be scouting out possibilities while we take time out for some business/holiday trips. After the next couple of months, who knows what state or country we’ll end up in. The thought of traveling with baby Q for the first time is daunting but we’re up for the challenge and definitely thrilled for the changes ahead. Happy New Year! 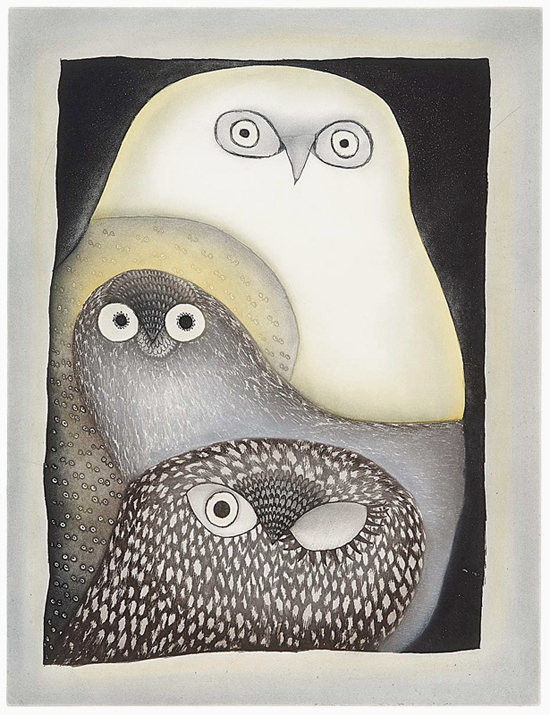 Actually, this beautiful piece is by Inuit artist Ningeokuluk Teevee. It is from the 2007 Cape Dorsett collection.